The possibilities are staggering, and not just from a zombie standpoint. AMC’s The Walking Dead still reigns as the runaway winner in ratings among advertiser-prized 18-to-49-year-olds, with 13.2 million of its 20.1 viewers in that age range. The distant No. 2 prime-time scripted series, Fox’s Empire, had a Season 1 average of 9 million viewers in this key demographic, according to Live +7 (days after) ratings from Nielsen Media Research. In that respect, AMC’s new Fear the Walking Dead prequel might just as well be called Milking The Walking Dead For All It’s Worth. Premiering on Sunday, Aug. 23rd with a 90-minute episode, it’ll be a hit if it draws even half of the original’s 18-to-49-year-old crowd. That would match this season’s haul for HBO’s Game of Thrones. Season 1 of Fear will be just six episodes, with Season 2 ramping way up to 15. The producers say they’re aiming for a “slow burn” this time out, with up-close looks at uninfected characters initially taking precedence over the mutants beginning to terrorize East L.A. OK, fine. But it’s easy to envision the original’s rabid fans getting restless and thirsting for quick gratification in the form of multiple exploding zombie heads and attendant violent acts. I mean, let’s get real here. This is not an audience that likely would sit still for even five minutes of Downton Abbey. Episode 1 of Fear begins in an abandoned church where something bad has happened. Drug-addicted misfit Nick Clark (Frank Dillane) rouses to this occasion after sleeping off his latest stupor. The young woman he’s been with has suddenly turned into a hideous something else. Fleeing the premises in a hurry, Nick is hit by a car and taken to a hospital in police custody. Why? Because he appeared to be on the run from a foul deed or something. It turns out Nick is the son of high school guidance counselor Madison Clark (Kim Dickens), a single mother whose fiancee is divorced English teacher Travis Manawa (Cliff Curtis). He also has a problematic, resentful son (Lorenzo James Henrie as Chris) while Madison’s daughter, Alicia (Alycia Debnam-Carey), is a high-achiever who’s fed up with her brother. So there’s a lot of angst here for starters. But beyond that, one question keeps rising above all of this. Let’s briefly set the stage. Travis and Madison then visit the church together so she can see for herself. Madison agrees that “something bad happened here.” But THEY DO NOT CALL THE COPS. Meanwhile, shackled Nick has rather unconvincingly escaped from the hospital in hopes of clearing his head and finding out if his girlfriend in fact was eating people alive at that church where bad things indeed happened but NO ONE CALLED THE COPS. Maybe I’m expecting too much elementary logic 101 from a series about an impending zombie apocalypse. Still, this kept eating at me, so to speak. Fear eventually gets around to a traffic jam caused by a staggering zombie and another bad thing happening to Nick. At the end of the premiere episode -- and this really isn’t giving away anything -- we get a two-pronged WTF from Travis and Madison. “What the hell is happening?” she asks. “I have no idea,” he replies. The producers of Fear say they won’t be catching up to the first days of The Walking Dead anytime soon. Nor will they be explaining how the zombies originated before they began to rapidly multiply. So good luck with all that. 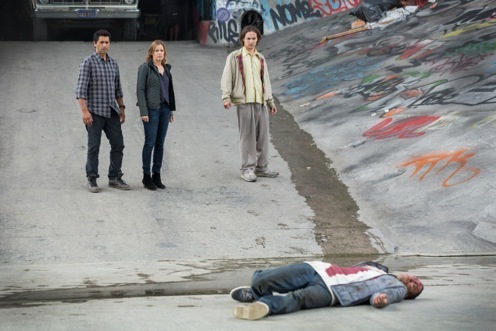 Fear the Walking Dead probably is in no danger of becoming an out-and-out flop in its first season. But its opening episode is appreciably less gripping than the 2010 unveiling of the smash hit original. There’s also the growing possibility that zombie and even shark fatigue might finally be settling in as the world perhaps moves on to -- oh, I don’t know -- pesticide-crazed giant killer potatoes from Idaho.